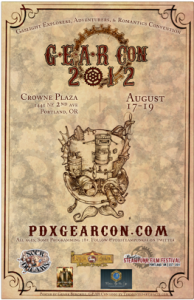 If you’re in gorgeous Portland, Oregon this weekend, come find me at the 2012 Gearcon, a celebration of all things steampunk. On Friday at 3p.m., Tina Connolly and I co-host the “Submitting Your Writing” panel. At 1p.m. on Saturday (listed as “Radio Theatre Hour”), join us for our dramatic costumed readings, one of which will star Ms. Connolly in my short play Industriously Yours. This will be the Portland debut of Industriously Yours, which won the 2011 STEAMfest play contest and was performed at Avondale Estates near Atlanta, Georgia. I’ll also be co-hosting the First Pages panel with M.K.Hobson on Saturday at 10a.m. and later participating in the Big Authors Panel at 5p.m. (the panel is big — some of the authors are quite little!) . As for the rest of the weekend, feel free to come chat if you see me drinking sadly alone at the hotel bar or typing madly in the lobby. . .and I’d love to have you come for my Sunday reading and Q&A at 1pm. Come ask me anything! Crowne Plaza Portland this August 17-19. Schedule is online, download the PDF here.